#BirdofMouth blogger Tim Young is a recent public relations and information systems graduate. Still trying to figure out where to live next year? Whether you’re a junior or transferring to Illinois State University, deciding which off-campus housing option to go with doesn’t need to be stressful. There’s a lot to think about, but don’t worry! When the weather gets cold or you’re running late to class, having a car can be a lifesaver, but you need a place to park it. Luckily, ISU parking passes are quite reasonable and easy to get. At the time of writing this, parking permits start at $87 per year, which will save you tons compared to pay-by-the-hour alternatives. When looking for an apartment, make sure that an adequate parking space is included before signing your lease. Since the quality of parking differs between apartments, I like to see the parking lot in-person to make sure I always have a good space. If you’re like me and like to get involved on campus, you really won’t spend that much time in your apartment. This means that luxuries like leather sofas and giant TVs don’t get much use. Each piece of furniture or technology that your apartment company puts in your apartment is going to mean a larger rent check. Take the time to think about what you really need and try not to pay for anything that’s unnecessary. Granite countertops aren’t going to improve your life in college, but having things like a washer and dryer or included cable will. Most apartments know your stay will be short, so they make it a little easier on you by including power, water, cable, and Internet into your rent. This means less check writing at the end of the month and you’ll never miss utility payments. When I was first looking for an apartment, I actually selected a slightly more expensive one because it included utilities. Whether you like or not, you’re going to be spending a lot of time with your new roommates; choose them wisely. I have lived with both friends and random roommates and each have their pros and cons. My best advice would be to lay down ground rules early on. If you’re a clean freak, you might want to consider living with likeminded people. Nobody wants to end up being the Mom or Dad of the apartment and doing all of the chores. Still looking for roommates? The Dean of Students Office has a great database to help you find future roomies and/or a place to live. 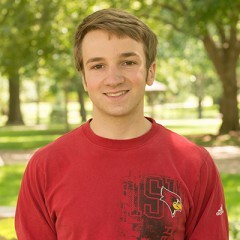 #BirdofMouth blogger Tim Young is a recent public relations and information systems graduate. Read more #BirdofMouth posts.